With a set of features developed from decades of industry-leading experience and based directly on customer feedback, the fi-6800 Production Scanner can help digitize large volumes of documents with ease. With fast 130 pages per minute and true double-sided scanning speeds of 260 images per minute, in colour, grayscale or black & white and up to 300 dots per inch (dpi), rest-assured the fi-6800's pure scanning speed certainly will not be the bottleneck in your scanning operation. Good things come in small packages and the fi-6800 delivers production level scanning speeds, yet without the sacrifice of a large exterior design. 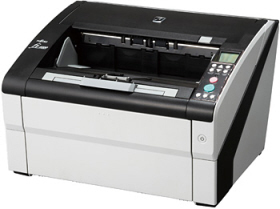 With its small footprint and quiet operation, the fi-6800 is suitable for in front-office environments and desktops where traditionally a Production Scanners' bulkiness and loud operation was unrealistic. The fi-6800 supports new automatic functions that make scanner operating tasks even easier, faster and more energy efficient. With high speed scanning, you will see your work productivity jump leaps and bounds. fi-6800 features patch code and barcode recognition functions which utilize patch code sheets or attached barcode labels. Whenever detected, files can be automatically routed to new subdirectories for expediting and automating post capture processing routines. In case of using barcodes, the files and directories can even be named according to the barcode encapsulated information. Combined with the image capture software ScandAll PRO's "Automatic Sorting" function, scanning / sorting / saving is all hands free. Reduce the hassle of post-scan tasks with "Automatic Stacker" and "Automatic Image Quality Checker"
Automatic Stacker ensures all your scanned documents are stacked neat and tidy while an Automatic Image Quality Checker detects any image irregularities (folds or tears in the scanned document) after scanning. Post-scan tasks have never been this easy. Utilizing fi-series' renowned "Paper Protection" Function and "Multifeed Protection" Function, paper feed problems are tackled before they happen. This brings optimum workflow to your business. And it ensures maximum uptime for the scanner, increasing operational efficiency.